I’ve introduced people to our world of clicks and grips and cups and strings through those very same three pieces of beech wood. Having given people a taste of what it’s all about, is that it? Should they then just move on? Oh, hell, no. While being a little heavier than the classic Ozora, the Kyu is still an entirely accessible kendama. It is certainly beneficial to those just getting into the beginner grades (a.k.a Kyu grades – hence the name). It is well-balanced, comfortable and sturdy. Not only that, but it’s as affordable as a first kendama ought to be. 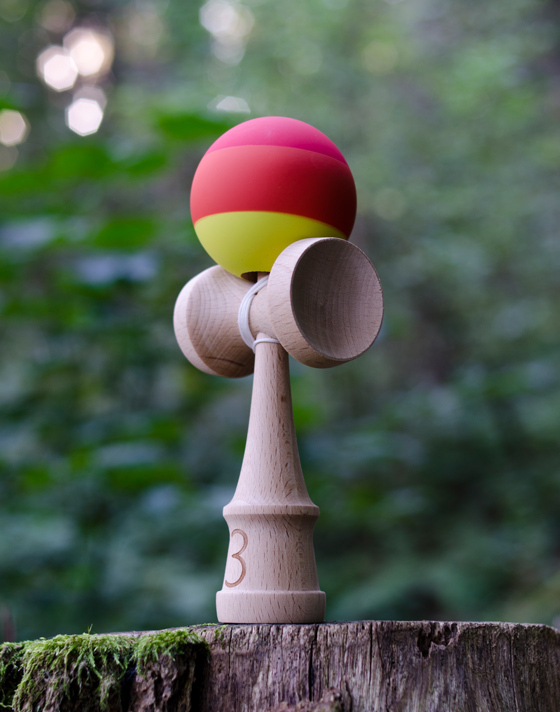 For beginners who are attempting their first tama trick (most likely the lighthouse), they may encounter a challenge with the unpainted ball. This is to be expected in the case of natural wood kendamas. It’s no harder on the Kyu than it is on the natural wood Ozora or TK-16, for example, but still tricky none the less. Once the tama’s worn in a little, the level of difficulty will ease off a bit. So, we’ve established it’s fine for beginners, but what about those with a more expanded repertoire? It’s tricky for me not to sound biased, as the Kyu is a product of this very website. All I can do is be perfectly honest. I’ve found the Kyu to be far better for suicide and other advanced tricks than my good ol’ Ozora. I guess I’d put it down to the weight. It just seems to flow better when doing handrolls and pinwheels and the like. Admittedly, I’d go back to my Ozora and Shin Fuji when doing exams, but that’s mainly because they’re lighter and therefore less of a strain on my inured old arms. You young’uns out there are unlikely to feel much of a difference. Is there a downside? Well, I do like a painted tama because they’re so pretty, but that’s just personal preference. Since it ranks alongside its counterparts from Yamagata Koubou, Sweets, Krom and SunRise, it has all the ups and downs one might expect. That is to say, it holds no nasty surprises and plays and feels like a good kendama should. Whether you’re starting out or blowing audiences away with your edits, give it a whirl.